A deal between British Telecom and a number of high street banks has resulted in new cash machines being linked to phone boxes. 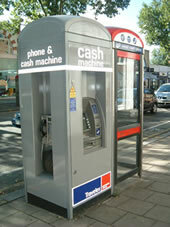 The initiative aimed at halted the spread of fee-charging cash machines is being piloted on Chiswick High Road. Where two BT phone boxes once stood together, there is now one enclosed BT phone plus a bright red HSBC cash machine with another BT phone attached at the side. The new machine has been met with widespread approval however not everyone is totally convinced. One local mother of three believes the machine is too exposed. Unlike the adjoining pay phone, the ATM is not enclosed. "Personally I wouldn't use it" she said "I will only use machines inside my bank or else get cash back." Cash machine companies earn £250 million in ATM charges every year, according to Nationwide with more than half of the ATMs in post offices and one in ten cash machines in hospitals are fee-charging. BT said it is keen to link up with other banks and building societies to offer free cash machines.